The first floor master suite has a beautiful bath, and 2 walk in closets. 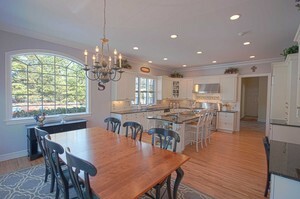 The kitchen has a wonderful work space with stainless appliances, granite counters and a huge dining area. The great room with a fireplace is accented with wall detail and moldings and has a wall of windows and doors that open to a covered porch overlooking the pool. The second floor bedrooms share 3 baths and there is a bonus room/media room, plus a loft/office space. Finished basement adds lots of extra space plus a gym and storage. Come See!